Box comes with headphones/mic to plug into the headphone jack. no case. the box has a strange way of opening it.. some things about motoblur i havent read about that we learned is that motoblur includes a “tracking” feature similar to the iphone so if you lose your phone you can track it online by gps.. either by current location or last known gps location. you can remote wipe the device.. if you remote wipe the device it “stores” the information on the phone but basically bricks it.. if you log back into your original device.. it brings your info back.. or into another one.. now the way it was explained is that your pictures/contacts are stored.. similar to the way danger did with the sidekick.. not sure if thats 100% though. no google apps. uses Telenav as a ‘pay per month’ turn by turn navigation. internet feature is required. it will use same feature as G1 and will have visual voicemail. honestly the device is incredible.. they are marketing it internal as a way to get Motorola back in the good graces of the customer. no release date was given.. but there will be a preorder.. which i think was shown on a brochure someplace? More Cliq Box pics after the break! Don’t forget to sound off in the comments with your excitement! Gah. I so want this phone…it’d make an awesome replacement for my G1. But with another year left on my contract, I’ll just wait until then and see what awesome new stuff has been revealed by then. No google apps….sorry…..Guess I’ll pass…..Hello..?! Who wants to pay for TeleNav when you have Google Maps….oh well….Guess it’s back to WinMo for me. I really don’t see what can cause excitement here. Its one of many thck full-screen sliders in the market. Not worthy of wow oe buzz. It has the obvious social networking stuff, which is all the rage these days, so good for marketing purposes. Would still like to see more competition for the iPhone_ Pre, Blackberry, and Hero. Rest of the phones can get in line. 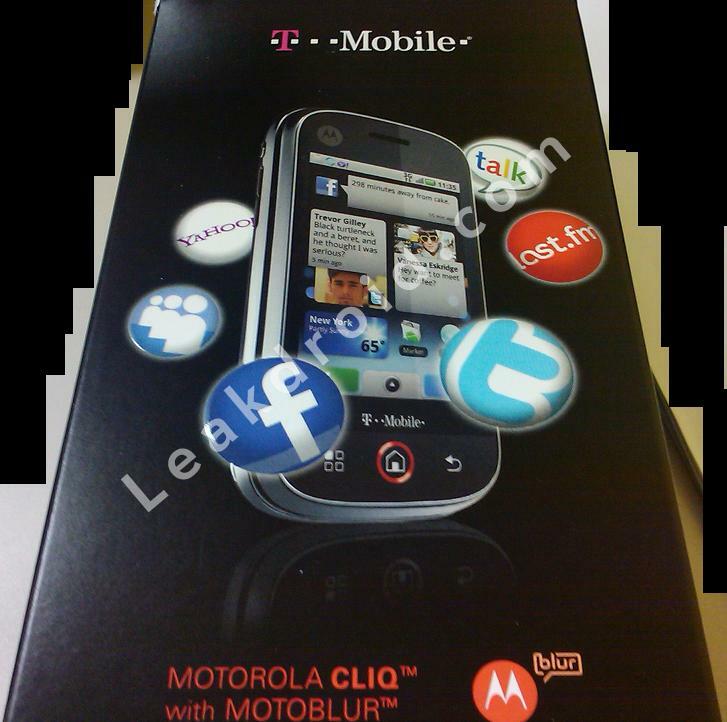 @Marcelo L go to Motorola Cliq Coming Loaded With Apps post from 24 September 2009 and click on the Phandroid link and you will see that it actually has Google services as well. I got my hands on this phone. It does have all of the google apps preloaded. I do have some issues with it though. I can sync my company email, and for some reason I cant send text messges. I can recieve them and I can send and recieve MMS, just not SMS. The text sez ‘no google apps’. 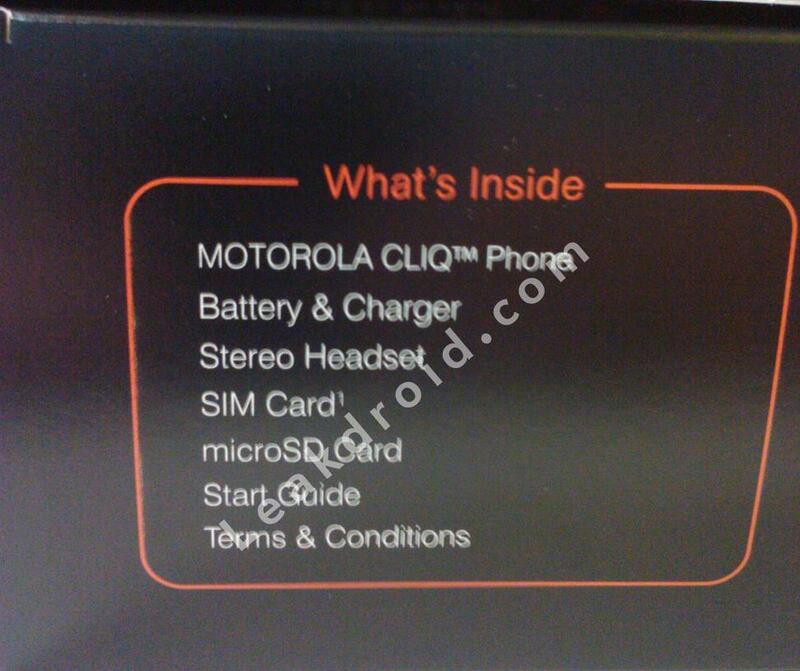 Yet box shows what appears to be a google talk logo. So who’s right? @asman No SMS? :-/ Also, how solid was the device? Would you get the Cliq or the MyTouch 3G if you were to choose between the two? The phone comes loaded with the typical android/google apps. From people I’ve talked to who have used the device the bgr article is a little extreme about the poor battery life, depending on how you have it configured it should be much better than that. 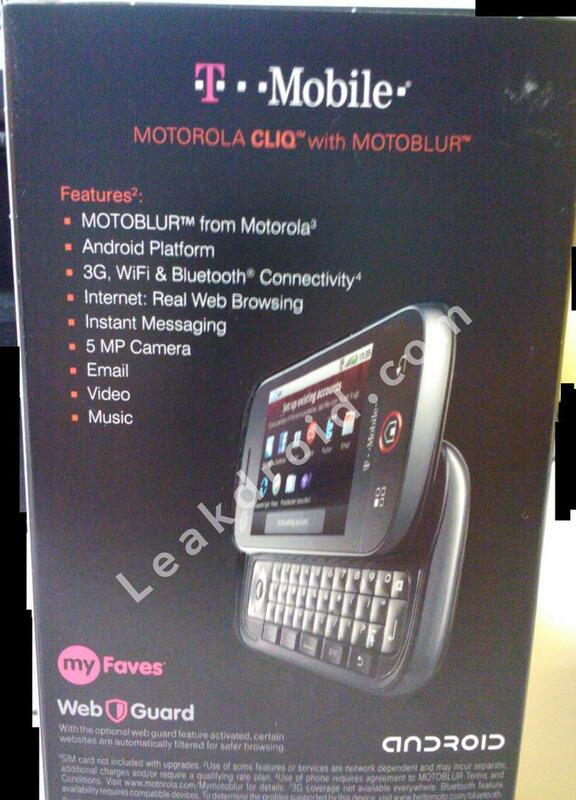 I’ll be receiving a moto cliq within the next few weeks and be abusing it to the best of my ability. My issue with all modern smartphones is battery life. I’ll be reporting back with my real-life experiences once I get mine. I really don’t see what can cause excitement here. Its one of many thck full-screen sliders in the market. Not worthy of wow oe buzz. Gee, what a revelation, someone on the planet does not like THIS particular phone. I thought it was the phone that everyone on the planet would like and want to buy. Next opinion. On the box, why is it that the super expensive T-Mobile Touch Pro2 came in a cheap little box, while other T-Mo phones, that cost less money, come in fancy, slick looking containers (e.g., the MyTouch). What applications will be available to CLIQ customers? CLIQ customers will have immediate access to myFaves from the home screen. Other T-Mobile features include Visual Voicemail, My Account, and Mobile Backup. CLIQ will also feature Google services such Gmail, Maps, YouTube, Voice Search, Google Talk, and, of course, search.